This past weekend I kicked off my BBQ season by busting out my charcoal grill for some BBQ chicken. I’m down to two bottles of supermarket sauce- Stubb’s BBQ sauce and Sweet Baby Ray’s Honey Chipotle Sauce. The chicken turned out tangy for Stubb’s, smokey and sweet with a slight after burn for SBR. For everyday BBQ, I’m leaning towards the sweetness of KC Masterpiece and Sweet Baby Ray’s over the likes of Stubb’s, Open Pit, and Mississippi. 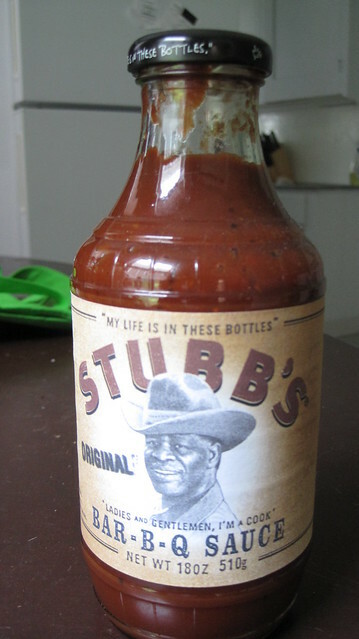 Out of the more vinegary sauces, Stubb’s is the leader. 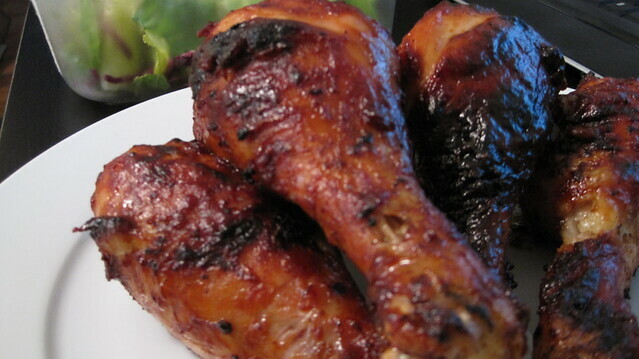 Remove chicken drumsticks from fridge and rub with BBQ sauce. Heat charcoal in a chimney starter until briquettes are all heated and grey. 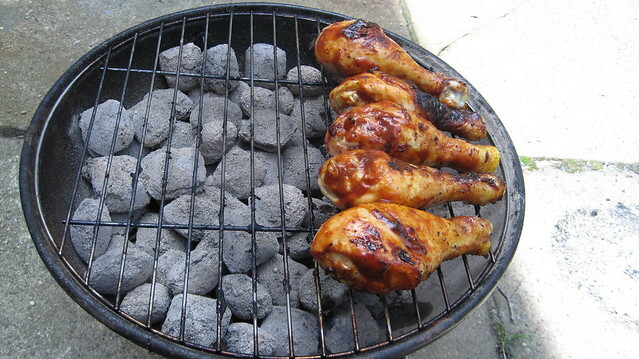 Pour coal into one side of of the grill to make a two zone fire. Place chicken on indirect heat side and cover. Make sure the side of the lid with open vents is the side with the chicken. Let cook in indirect heat for about 20 minutes. Brush additional sauce over chicken and let cook for another 10 minutes. Brush more sauce over chicken and move chicken to direct heat. Watch chicken carefully and rotate pieces to get an even char to get the skin crispy. Add more sauce if desired. Cook until juices run clear or until 180 degrees internal temperature. Hot, Sweet, and Irresistible. Just. Like. Me.